Aizawl, Jun 11 : The main opposition Mizo National Front on Saturday accused then ruling Congress party of misusing its power in the recently concluded Mara autonomous district council polls where the latter won 15 of the 25 seats. 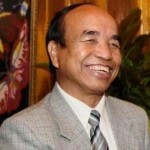 "The Mizoram government employed its power, money and every unfair means to win the elections. The new (Congress) government in Mara autonomous district council is not a public mandate as it is formed with unfair means taking advantage of the people's poverty," H C Lalmalsawma Zasai, president of Mara district MNF, told a press conference here. The MNF even accused the state election commission of showing undue favouritism to the ruling party when it (the commission) accepted "incomplete" nomination papers of Congress candidates and turned a blind eye to "violations" of the election model code of conduct. Zasai alleged that ten Congress candidates filed their nomination papers leaving the affidavit papers blank. "When we complained to the election commission officials, they dismissed it as a 'minor case.' The CCB (constitution and conduct of business) rules and observers handbook do not say so," he said. If the election officials had gone by the rules, ten MNF candidates would have been elected uncontested, he said. Since the day of the announcement of election date, all the guest houses, inspection bungalows and tourist lodges were booked for Congress campaigners, which the MNF said, was a violation of model code of conduct which states that all contesting parties should be given equal share in the government-run guest houses. The Congress government also "transferred" two Home Guard personnel as they were suspected to be supporting the MNF party. "Whereas no official is supposed to be posted in home town or village as election official, the state election commission acted the opposite and such officials worked in favour of the ruling party," the MNF leader said. Where was the election watchdog Mizoram People's Forum when Congress candidates distributed GI sheets, refrigerators, mobile handsets, washing machines, carpets to the voters? "The Congress party lured the poor voters in the villages with feast, goods and money. In such situation, the voters were unable to use their conscience," the MNF leader said, adding, "We longed for the MPF." Accusing the SEC of not paying heed to the MNF's written complaints with photographic evidences, Zasai said, "That only deepened our distrust on the state election commission." Terming the 2012 elections as the dirtiest elections in the history of Mara district council, the MNF leader said, "The trend that the Congress party has introduced can leave far-reaching negative impact on the future politics of the Mara council." However, even with all these "unfair means", the ruling party managed to win only 15 seats whereas the MNF-MDC (Maraland Democratic Front) alliance got 10 seats.